150ml pack includes brush and scourer pad. Ecozone Descaling Gel effectively and gently removes lime scale from Tap's and Showerhead - scratch- free! It’s so easy to use just apply the Gel directly to the brush provided, then apply to the limescale. After a few hours rub the treated area with the sponge provided and then rinse throughout, washing away any remaining Gel. For heavy limescale repeat the process if necessary. It's safe to use on ceramic and plastic suites. Use regularly to maintain shiny looking taps and shower heads. Irritating to eyes and skin. Always use below eye level to avoid getting solution in eyes. Remove shower heads from their support or disconnect before applying gel. Keep out of reach of children. Avoid contact with skin and eyes. Not for use on Marble, Stone, Gold or Silver, Aluminium, Copper, or Enamel plated surfaces. Please note that Limescale can damage surfaces. This damage may be noticable once the limescale has been removed. It will not have been caused by Ecozone's Tap and Showerhead Descaler. 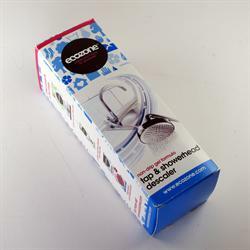 Be the first to submit a review for the Ecozone Tap and Showerhead Descaler Gel.